We are grateful for all our sustainable education program, product, equipment and in-kind resource sponsors! 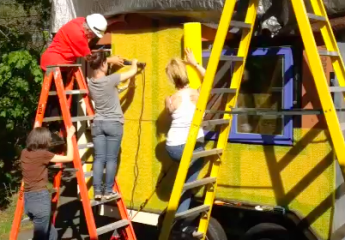 You can also donate directly to the Silver Bullet Tiny House education module by clicking the PayPal button below. Send Vera a cup of fair-trade coffee for a donation of $10. 100% of our donations go to educational exhibits, sustainable workshop materials and workshop scholarships for students in need. We only use those products, equipment and resources that are ecologically sound, appropriate to our sustainable projects and have the smallest environmental impact. Vera, I just saw your YouTube video a bit ago, earlier in these wee hours, and still have God chills…I’ll write more in a day or so after some things calm down here in my world, but I just had to reach out to you and say how impacted I was upon seeing your tiny house and a glimpse of your story. I’m here in Orange County, CA looking to create suitable and sustainable shelter for homeless seniors…like me (I am also 66 years old, be 67 in December), and have recently discovered that the tiny house movement has taken hold and is growing very fast! My idea is to use old refurbished RV’s, and now that idea has been taken to the next level with the discovery of the tiny house model. Then, finding what you’re doing…oh my goodness…well, I’ve got to stop now, really. I am so excited about your work. One of the two directives I was given by Spirit at the beginning of this journey was to Trust that all is occurring in Divine Right Timing – and that’s certainly been demonstrated this day. It is always a pleasure to learn that my story can inspire others. I am interested in helping the homeless by giving them a hand-up, not a hand-out. My concept is to help them design/build their own small homes on wheels from reclaimed/repurposed/recycled/donated resources. I wish for them to own the process as well as their new home. Not sure I’m interested in RV’s, not many are well built and insulated for year round living; nor are their systems sustainable or renewable. As you may know, it takes at least twice the time and effort to reclaim/repurpose/renew a resource than just buying “new”. However, if you are interested in zero-waste micro-housing made of non-toxic reclaimed materials that only employs renewable/sustainable systems thinking, we should talk.